Any Pizza £7.99 - Collection ONLY. Classic Crust! 1 pizza per order to get this deal. Who pays £18 for a pizza anyway? I mean really. Even 7.99 is overpriced. 12.99 on offer for me, poor. 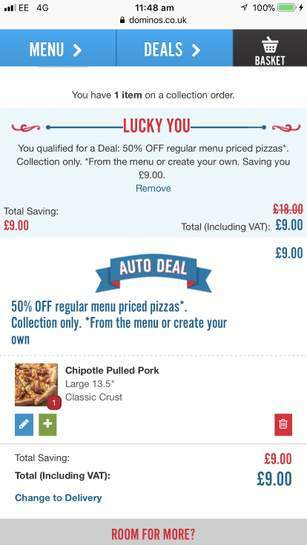 LUCKY YOUYou qualified for a Deal: Collect Special - Any large pizza ONLY £12.99. Saving you £5.00. Need to specify the branch as this is not a national offer.